How do animals perceive the world, learn, remember, search for food or mates, communicate, and find their way around? Do any nonhuman animals count, imitate one another, use a language, or have a culture? What are the uses of cognition in nature and how might it have evolved? What is the current status of Darwin's claim that other species share the same "mental powers" as humans, but to different degrees? In this completely revised second edition of Cognition, Evolution, and Behavior, Sara Shettleworth addresses these questions, among others, by integrating findings from psychology, behavioral ecology, and ethology in a unique and wide-ranging synthesis of theory and research on animal cognition, in the broadest sense--from species-specific adaptations of vision in fish and associative learning in rats to discussions of theory of mind in chimpanzees, dogs, and ravens. She reviews the latest research on topics such as episodic memory, metacognition, and cooperation and other-regarding behavior in animals, as well as recent theories about what makes human cognition unique. In every part of this new edition, Shettleworth incorporates findings and theoretical approaches that have emerged since the first edition was published in 1998. The chapters are now organized into three sections: Fundamental Mechanisms (perception, learning, categorization, memory), Physical Cognition (space, time, number, physical causation), and Social Cognition (social knowledge, social learning, communication). 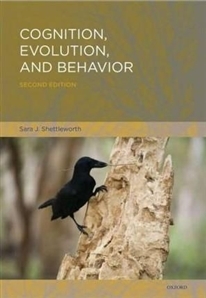 Shettleworth has also added new chapters on evolution and the brain and on numerical cognition, and a new chapter on physical causation that integrates theories of instrumental behavior with discussions of foraging, planning, and tool using.